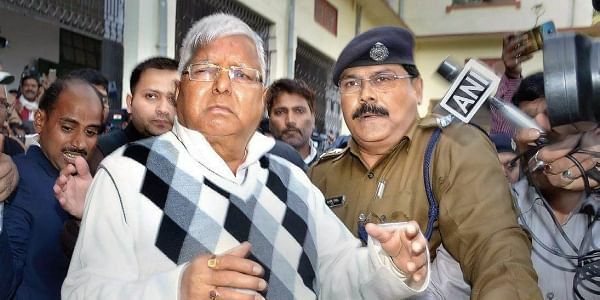 PATNA: In a huge blow to the Rashtriya Janata Dal, its national boss Lalu Prasad was on Saturday convicted in a Bihar fodder scam case involving fraudulent withdrawals of `90 lakh from Deogarh treasury between 1994 and 1996. Lalu was taken into custody minutes after the verdict was delivered in the packed courtroom of special CBI Judge Shivpal Singh. He was taken to Birsa Munda Central Jail at Hotwar on the outskirts of Ranchi. This is the seventh time he is being jailed in connection with the fodder scam. The special CBI court in Ranchi will announce the quantum of sentence on January 3. The 69-year-old leader, a two-time Bihar Chief Minister and a former Union Railway Minister, was among 16 accused convicted on Saturday. Congress leader Jagannath Mishra, 80, who served as Bihar CM immediately before Lalu, was acquitted along with five others. This is the second case in which Lalu has been convicted in the `1,000-crore fodder scam. In September 2013, he was sentenced to five years in jail for fraudulent withdrawals of `37 crore from the Chaibasa treasury. The Supreme Court granted him bail in December 2013. The present case, RC 64(A)/96, pertains to fraudulent withdrawals from Deoghar district treasury when Lalu was Bihar chief minister. When he was convicted in 2013 in case RC 20-A/96, he was MP from Saran in Bihar. Lalu then lost his Lok Sabha membership and was debarred from contesting polls for 11 years.On Saturday, nearly 50 RJD legislators and senior leaders had gathered at the court in Ranchi, along with thousands of RJD supporters from Bihar and Jharkhand. Lalu, who was accompanied by younger son and Bihar Opposition leader Tejaswi Yadav, looked tense and refused to answer journalists’ queries. In a series of tweets on his way to jail, Lalu sought to portray his conviction as the result of social clashes between the upper and lower classes and castes.“Powerful people and powerful classes always managed to divide society into the ruling and the ruled classes. Whenever anyone from the lower hierarchy challenged this unjust order, they would be deliberately punished,” he tweeted. “We will appeal against this verdict in the high court. We have full faith in the judiciary,” said senior RJD leader and Lalu aide, Jagadanand Singh. Jagannath Mishra, who was accompanied by his son and JD(U) leader Nitish Mishra, expressed gratitude to the judiciary for his acquittal, saying he had “absolutely no role” in the scam.